Finfeed’s stock of the week is Bellevue Gold (ASX:BGL), a company that we featured in our weekly Trifecta column on January 8 when discussing the compelling nature of some Australian gold stocks which stand to benefit from recent increases in the gold price and a declining Australian dollar. This perfect combination of currencies and commodity prices sees the Australian dollar gold price hovering in the vicinity of $1800 per ounce. Since featuring Bellevue its share price has increased 35%, hitting an all-time high of 57.5 cents on Wednesday after releasing an impressive resource upgrade at its Bellevue Gold Project in Western Australia. However, it isn’t just us who see the merits of the stock, or investors who can’t get enough of Bellevue. 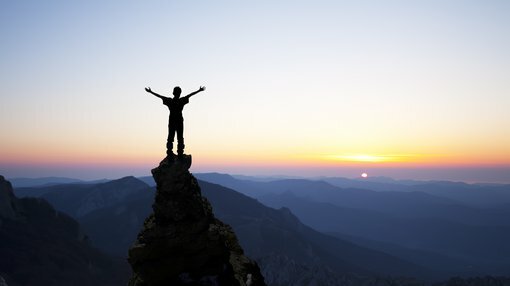 On January 15 (prior to the recent resource upgrade) analysts at Macquarie Research nominated it as their ‘high conviction top explorer pick winner for 2019’. As a backdrop, the 3600 square kilometre project area is in the northern part of the Norseman-Wiluna Greenstone belt in the Yilgarn Craton, WA. The Bellevue Project has a rich history, having produced 800,000 ounces of gold at an impressive grade of 15 grams per tonne. What has got Macquarie excited? There were a number of reasons why Macquarie chose Bellevue as its pick stock from scores of global explorers that made its shortlist. The key factors supporting the brokers bullish stance on the stock were the outstanding high-grade nature of the deposit, the substantial exploration upside from extensions to existing deposits and new discoveries adjacent to those already delineated, as well as the base case scenario of establishing a low-cost high-grade mine with production of approximately 120,000 ounces per annum over a mine life of more than eight years. Analyst, Ben Crowley added “We believe Bellevue has strong acquisition potential given the project’s high-grade and its proximity to a sealed highway”. 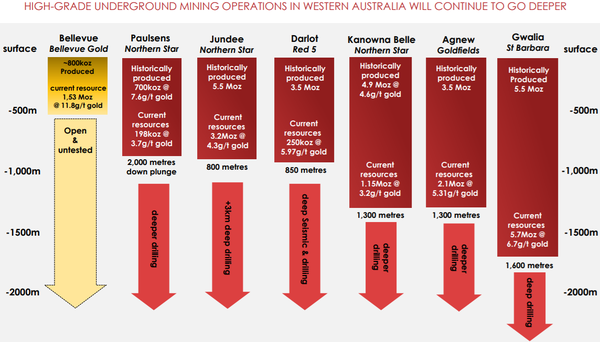 In relatively close proximity are mines operated by other producers and explorers, including prominent players such as Northern Star Resources (ASX:NST), Saracen Mineral Holdings (ASX:SAR) and Gold Fields Ltd (NYSE:GFI). Bellevue has assets within prolific gold and nickel belts. Northern Star is a company that has for the best part been built from the ground up by aggregating producing mines with associated exploration upside. This transformed the company into a 600,000 ounces per annum producer which over the last five years has delivered its investors a 10-fold share price increase, while also paying strong dividends. As at December 31, 2018 the group was debt free and had $292 million in cash and cash equivalents , arguably making it one of the best placed financially to acquire Bellevue. Even setting aside the prospect of acquisitions, Bellevue has the ability to meet the magic 100,000 ounces per annum mark, plus some. Determining just how large a producer the company can be is a real ‘how long is a piece of string’ question given the group has multiple high grade deposits. Most of these are yet to be drilled at depth and have extensions in most directions which suggests that the company can build a much larger resource than is currently reported. On this note, approximately 90% of the resource is within 450 metres from the surface and is adjacent to existing historical underground workings where there is significant scope for rapid expansion. To appreciate the high grade nature of the deposit it is worth examining recent data which only serves to reinforce the historical resource grade of 15 grams per tonne. Recent drilling at the adjacent Viago Lode has returned a drill result of 4.3 metres at 58.8 grams per tonne gold, and nearby holes returned 3.4 metres at 10.4 grams per tonne gold and 2.5 metres at 13.1 grams per tonne gold. 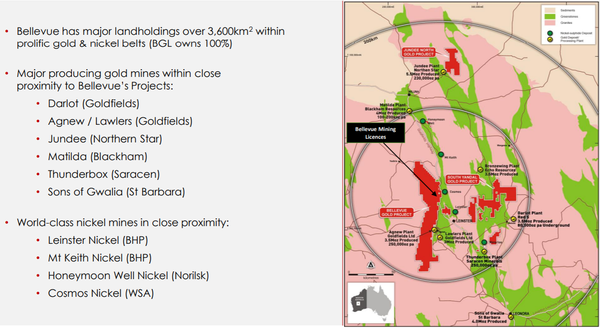 Analysts at Macquarie are buoyed by the fact that the recent resource expansion only relates to the Bellevue Surrounds resource areas which it considers as the lowest grade domain. Given the company has achieved a 53% uptick in global tonnes and a 47% lift in contained metal with the inferred resource grade of 11.8 grams per tonne only slightly lower than the previously reported 12.34 grams per tonne, one can only expect the grade to be maintained for some time with the potential for increased grades from other parts of the deposit. On this note, managing director Steve Parsons said, “The latest upgrade once again confirms the exceptional quality of the Bellevue Gold Project which is globally one of the highest-grade and fastest growing gold projects and we are confident further drilling will continue to rapidly advance the resource base in 2019”. The other impressive feature of the company’s progress to date is the efficiencies and low costs of exploration. 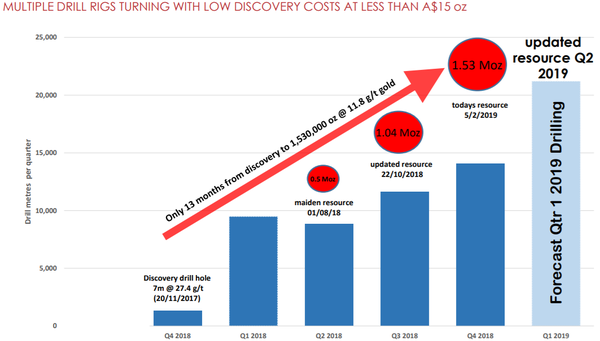 In just over 12 months since drilling commenced, the company has been able to establish a sizeable resource at a low discovery cost of less than $15 per ounce. Bellevue has established a sizeable resource in the last 12 months. In discussing financial metrics it is worth noting that Macquarie estimates all in sustaining costs (AISC) during its estimated mine life of just over eight years will be approximately $840 per ounce. Based on the current Australian dollar gold price this implies a margin of $1000 per ounce. While the mineralisation at areas adjacent to Bellevue Surrounds would appear to offer higher grades, a bolstering of mineable ore from this area is important and as it is located within metres of the historical underground mine development. Surrounding areas offer higher grades. However, in the March quarter the company will turn its attention to delineating further resource ounces from step out drilling with the four drill rigs at the very high grade Viago Lode and Western Corridor. The following demonstrates the high grade targets that lie to the north (Kathleen Valley) and south (Viago, Tribune and Southern Belle) of the established mine, and also underlines the close proximity which would enable the company to establish a high-volume operation. High grade targets to the north and south. Parsons has indicated that drilling results will come to hand in the March quarter may well be a share price catalyst, but the real kicker will be in the June quarter when the company will upgrade the resource. Commenting on its expectations regarding the upcoming exploration program, Macquarie said, “We expect further resource growth with another resource update in the second quarter of 2019, while ongoing drilling results are also likely to be positive. “We make no changes to our mining inventory assumptions (3 million tonnes of material at 10.8 grams per tonne for approximately 1 million ounces of gold) as we view the expanded resource as supporting our base case. 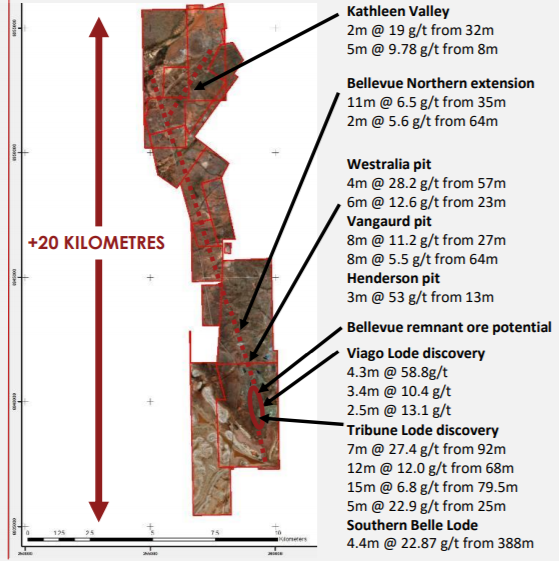 The following demonstrates the similarities between Bellevue and nearby large producing mines, and if anything, suggests that exploration could see the development of a project that features higher grades and potentially larger production, particularly if the company is successful in extending the resource at depth. Exploration could lead to higher grades.